We are a local, family owned and operated pest management company. The business itself has been established for over 40 years. With a focus on safe and environmentally friendly pest management solutions, we pride ourselves on providing our clients with a highly qualified and experienced service that they can trust. Ensure the best results for your property with our innovative approach to pest management. At Gawler Pest Control, we provide services for effective management of annoying and harmful pests. Our innovative approach to all pest related problems helps to ensure safe and reliable results. We utilise detailed reporting systems that provide both accurate service records and track the progress of our management systems. This ensures that our clients have up to date information when needed. Whether at a domestic, commercial or industrial level, we provide reliable solutions for pest problems such as: Termites, Spiders, Rats, Mice, Cockroaches, Bees, Wasps, Ants, Millipedes & Earwigs. Approved to work with Children, the Elderly and Disabled. Our Company Director, Evan Crouch, has worked for Gawler Pest Control since 2002 and has owned the company since 2009. 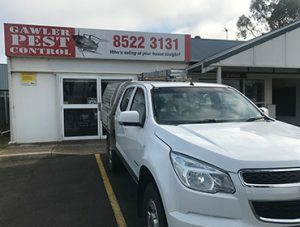 Pest Control in Gawler and Barossa for Termites, Spiders, Mice, Rats, Cockroaches, Bees & Wasps.